One coil each under an adjoining pole-pair is connected between adjacent commutator segments in a lap-wound dc armature, while in a wave-wound armature the only difference is that P/2 coils under the influence of P/2 pole-pairs are connected between adjacent segments. Coil(s) current is constant and unidirectional so long as the coil is under the influence of given pole-pair(s), while it reverses (commutates) when the coil passes onto the next pole-pair as the armature rotates. The process of current reversal called commutation takes place when the coil is passing through the interpolar region (q-axis) and during this period the coil is shorted via the commutator segments by the brush located (electrically) in the interpolar region. 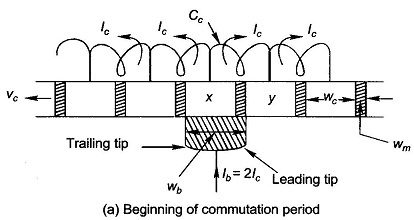 Commutation takes place simultaneously for P coils in a lap-wound machine (it has P brushes) and two coil sets of P/2 coils each in a wave-wound machine (electrically it has two brushes independent of P). even when wb > (w, + wb,) in which case more than one coil undergoes commutation simultaneously. Before the causes underlying under-commutation and consequent sparking are explained, the deleterious effects of sparking and why it cannot be tolerated to any large degree may now be studied. Sparking leads to destructive blackening, pitting and wear and eventual burning of commutator copper and brush carbon. It must, therefore, be limited to a tolerable intensity to prolong life of commutator-brush assembly to an acceptable value. As completely sparkless commutation is not possible practically (for reasons advanced below), the carbon brushes must be replaced after some time and less frequently commutator “turned” to a slightly smaller diameter to prepare a fresh clean surface. 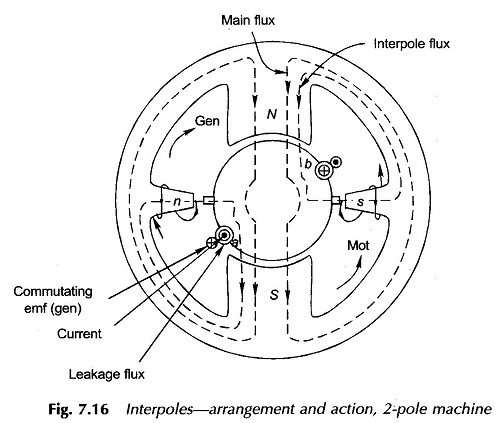 The leakage inductance of the coil (see Sec. 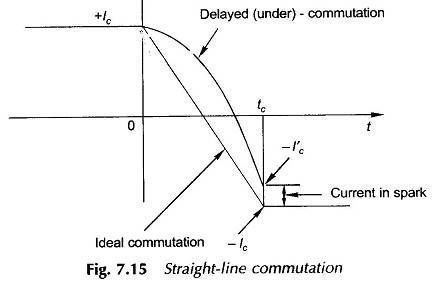 5.8) undergoing commutation has induced in it reactance voltage Lc(di cldt) which opposes the change in current thereby delaying commutation. Also, usually more than one coil undergo commutation simultaneously, the induced voltage due to mutual inductance among them also tends to prevent current reversal. The effect of armature reaction causes shift in MNA as shown in Fig. 7.9(c) from A, B to A’, B’. Since the brushes are located at A, B(GNA’s), a small voltage is induced in the commutating coil. It opposes current commutation (both for generating/ motoring machine) as the commutating coil is cutting the flux which has the same sign as that of the pole being left behind. There are two ways of achieving good commutation—close to straight-line commutation. These are resistance commutation and voltage commutation. The former is always used to give marginal support to the latter. 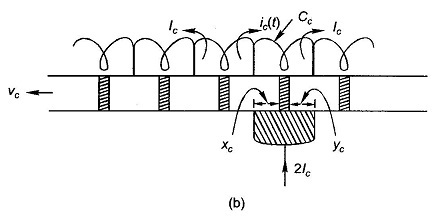 High contact resistance between commutator segments and brushes, achieved by using carbon brushes, arl.lb resistance to the circuit of the commutating coil thereby reducing the tie–lc-constant (L/R) of the current transient (ie(t)), helping it to change faster the desired direction. Carbon brushes are invariably used in dc machines. ney also help reduce commutator wear and are themselves easily replaceable. 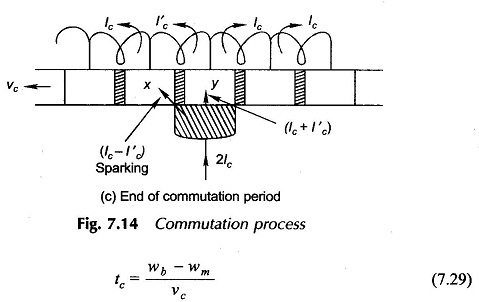 To speed up the commutation process, the reactance voltage must be neutralized by injecting a suitable polarity dynamical (speed) voltage into the commutating coil. In order that this injection is restricted to commutating coils, narrow interpoles (also called commutating poles or compoles) are provided in the interpolar region. These apply a local correction to the air-gap flux density wave such that a pip of appropriate flux density exists over the commutating coil to induce in it a voltage of the same sign as that of coil current after commutation. For neutralization of reactance voltage at all loads, the interpoles must be excited by armature current by connecting them in series with armature. Arrangement of interpoles, their polarity relative to the main poles, flux pattern of both sets of poles and one commutating coil are shown in Fig. 7.16. It is easy to observe from this figure that polarity of an interpole is that of the main pole ahead in the direction of armature rotation for the generating mode and that of the main pole left behind with respect to the direction of rotation for motoring mode. The interpolar air-gap is kept larger than that of the main pole so that their magnetic circuit is linear resulting in cancellation of the reactance voltage (a linear derivative term) at all loads. Large air-gap results in greater amount of leakage flux which is accommodated by tapering the interpoles with a wider base as shown in Fig. 7.16. As relationships of Eqs (7.30) and (7.31) are based on sweeping approximation and also accurate estimate of the coil leakage inductance Lc. cannot be obtained, the attainment of good commutation is more an empirical art than an analytical science. Furthermore, only good commutation can be achieved but not perfect commutation. One can always observe some sparking at the brushes of a dc machine in operation. It is not necessary to have interpoles equal to the number of main poles and to reduce cost, especially in low-power dc machines, interpoles of the same polarity are often fitted in alternate interpolar spaces only.